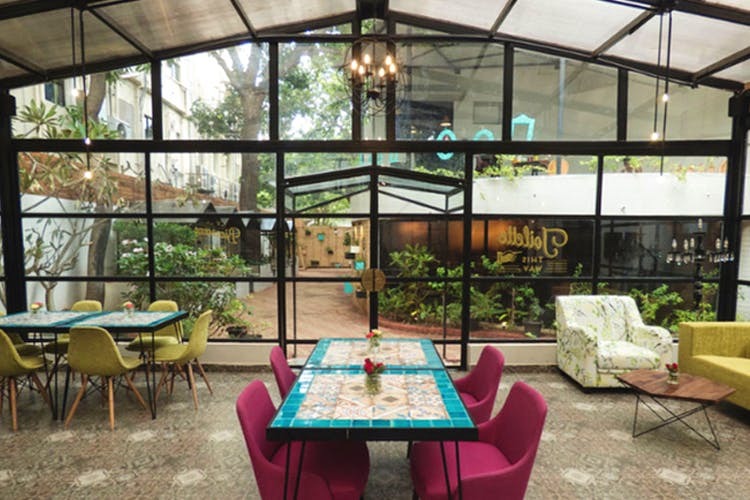 Head to Cafe De Paris in Teynampet for a rendezvous like no other. Fall in love with the cosy ambience (reminiscent of restaurants on cobblestone streets in Europe) and fresh baked goodies. Find a bit of Paris right here in namma Chennai. Looking for a restaurant with a gorgeous outdoor setting? Or how about having a meal in a pretty glass house while the skies send over a light drizzle (ooh la la)? Better yet, feel like visiting a Parisian bakery serving fresh baguettes and croissants, macarons and coffee eclairs? Café De Paris in Teynampet has it all! Oh and there’s free Wi-Fi too. So much win. Café De Paris is a place you must visit if you love good food with an even better ambiance. Start with appetizers – there are fries of course (mix it up with chilly cheese or beef chilly) and Assorted Bruschetta (with mixed olives, mushrooms, and tomato basil). We tried Pita Platter (to share with our vegan BFF). The pita was so soft and the hummus and baba ganoush were lip-smackingly yum. We’d recommend trying the Twisted Pizza which is an in-house specialty with eight folds filled with chicken/beef, bell peppers, onions, topped with mozzarella and served with cheese sauce. You can try their signature blends of coffee or have tiramisu or pannacotta for dessert. So, would we come back for more? It’s an oui oui from us! Our only complaints would be that the Pasta Arrabiata was a bit too spicy (for our palate) and the steak was very chewy.